Ep. 5: Anne Akhila – A Woman of Many Talents | Aimee J. What does it look like to chase your dreams? Too many people believe in an idealistic dream, one that works out step by step just as they imagine it. But seldom do dreams work out that way, and seldom to we find ourselves content to walk that path anyway. Today’s guest is a long time friend of Aimee J.’s – Anne Akhila. Anne is many things: a lawyer, dancer, and actor among them. Aimee wanted Anne to come on the show because she’s a great example of someone who his having fun while pursuing her dreams, and not listening to anyone who tells her that she can’t do it. You’ll like Anne. She’s a spot of light in the darkness. Be sure to listen to this fun chat. Pursuing what makes you happy changes over time… have you noticed? As you grow older the things that make you happy change. It’s probably because you’re growing up, “maturing” as they call it. Or maybe it’s because when you’re younger you have different interests, things that are appropriate to the place you’re at in life at the time. But with age come heavier burdens and issues and the ability to better understand them, and your relationship to them. Anne Akhila shares her story in this episode, a story about how she’s pursued a legal career from a desire to be an advocate for people who need one. At least for a while, she thought that’s all she could do, but in the back of her mind, some other dreams wouldn’t let go. She’s also got these dreams of being an actress and dancer – and she won’t give up on any of them. 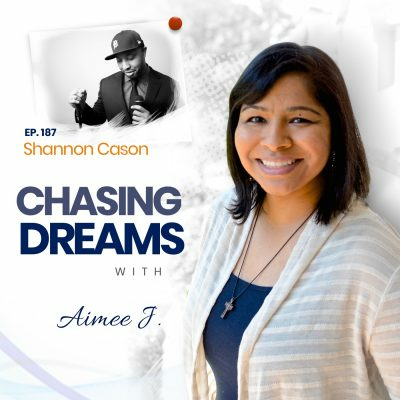 Hear Anne’s story on this episode of Chasing Dreams. What makes you happy changes over time. Are you flexible enough to allow the changes? It’s a human tendency to want to clearly label things. It helps us comprehend and manage the world we live in. But the danger comes when we try to label people. People are more complex than that. They defy labels. When Anne Akhila first started pursuing a legal career people told her that she’d have to give up her dreams of being a dancer and actor, even though she’d been dancing since the time she was very small. Something in her didn’t like the pressure. 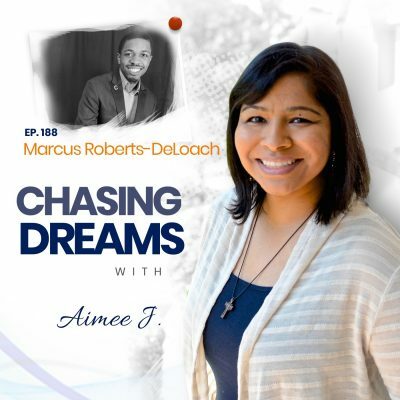 Something in her rebelled when people said to her, “You can’t pursue all of your dreams.” Anne’s response was, “Why not?” Hear how Anne describes her attitude about chasing multiple dreams and how it’s working out in real life, on this episode. Whatever it is you want to do, you’ll accomplish it with small steps. Very few people wind up being an “overnight success.” The general public may come to hear about them in a seemingly overnight fashion, but the truth is that those who are successful have been chipping away at the obstacles to their success for many, many years. Whatever your dream is, you’ve got to go after it step at a time. Each small steps takes you one step closer to its realization and develops in you another skill or piece of knowledge to make you able to handle it when it comes. In this episode Anne Akhila shares the story of how she’s continued to pursue her dreams by taking the steps available to her at the time, and how it’s led to moves, new opportunities, and intentional enrollment in classes and courses. She’s not giving up on her dreams. Listen to her story to be inspired not to give up on yours. What are your dreams, and how are you going to intentionally pursue them? 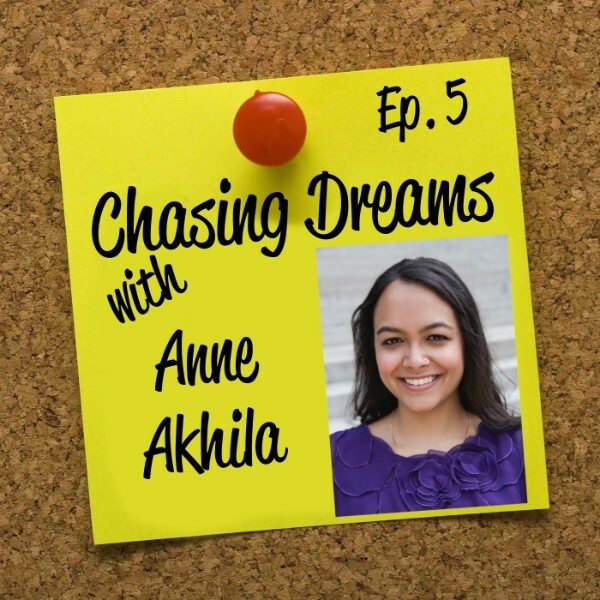 Anne Akhila (the guest featured on today’s podcast) is a wonderfully happy example of what chasing your dreams can do for you. She demonstrates that chasing your dreams is not just about getting to the end result, it’s about the growth that happens in you and the skills and relationships you develop on the way to the dream. But you’ve got to be intentional if any of those beneficial things are going to become real in your life. Sitting on the couch at home won’t do it. You’ve got to go out there and get it. Listen to Anne’s varied story of growing up with dreams, law school, improv classes, and acting and learn that there are no limits except the ones you decide to accept. [4:06] Introduction of Anne Akhila, lawyer and entertainer. [6:32] Why Aimee wanted to have Anne on the show. [6:56] Did Anne always know what she wanted, or did it grow over time? [8:43] How the answer to what makes us happy changes as we grow up, and how it’s difficult to allow that change to happen. [10:32] How dancing prompted Anne toward entertainment in the first place. [11:58] Pursuing acting whenever she could. [17:43] The importance of continuing to move toward your dreams and connecting with people in order to do that. [18:36] The small steps that lead to doing what makes you happy. [19:30] The power of Youtube for education and for learning to become comfortable at what you desire to do. [23:40] The Rapid Fire Game! [25:50] The Rapid Fire Game with an Improv Twist! [30:40] The benefits Improv could have for anyone and everyone. [33:05] Aimee’s summary of this episode and thanks to Anne for being on the show! [33:25] A new website: http://www.ThankYouYT.com – a tribute to all the people who have put helpful videos on Youtube! Aimee and Anne play a “back and forth” game, each in turn naming a Saturday morning cartoon. The first to miss, hesitate, or speak a wrong answer is the loser. Who’s gonna’ win it? AND… since Anne is into improv, Aimee adds a special “Improv Twist” at the end of the game… with the category: Boy Bands.